Always been told to go Green? Well, maybe it’s time to make way for Purple! We grew up being told to eat our greens, but perhaps we should have been packing our plate with purple produce instead. Well, purple is set to be the hottest hue in the produce aisle, from carrots, cauliflower, sweet potato, cabbage, eggplant and kohlrabi to blueberries, plums and acai berries. In the past, you’d be unlikely to find purple headlining anywhere beyond a dismal canned beetroot salad or punnet of blueberries, but thanks to acai bowls and eggplant making waves in the health food scene, we’re now on the verge of purple food proliferation. “Normally blueberries are a highly impulsive fruit but now our supply has gone up, we have seen an increase in sales by 75%, red cabbage by 13% and eggplant by 30%,” says Farrell. Nutritionist Monique Cashion puts this down to local and international trends. “In Australia, purple sweet potato, carrots, eggplant and queen garnet plums from Queensland are becoming popular, meanwhile purple corn, asparagus and cauliflower, as well as purple corn cereal, tortilla chips and sweet potato chips are appearing in health focused supermarkets in the US,” says Cashion. Yet, while they undisputedly have Instagram appeal, it’s the nutrient behind the rich purple pigment known as anthocyanins that is garnering attention, thanks to its potential ability to lower the risk of heart disease, diabetes and dementia. A Harvard University study, which looked at more than 93,600 women aged between 25 and 42, found those who ate a half cup serving of blueberries and strawberries (containing anthocyanins) three times a week were 34 per cent less likely to suffer a heart attack than women who didn’t. The research attributed it to the anthocyanins (a subset of the chemicals known as flavonoids) being able to lower blood pressure and make blood vessels more elastic. However, while they were found heart-healthy, the lead researcher noted they were “dietary good guys” but not definitive. Another study also found anthocyanins aren’t just heart-healthy but can potentially give our brain a boost. The University of Reading study found flavonoids (including anthocyanins) have neuroprotective benefits that can protect the brain against injury and inflammation and maybe fight the risk of dementia, with research indicating they could potentially promote memory, learning and cognitive function. Meanwhile Ohio University is investigating whether the purple pigment could have cancer-fighting abilities. Black raspberries have chemopreventive effects on the mouth, esophagus and colon tumours in animals, and researchers are now looking at whether anthocyanins across all berries have the potential to ward off oral cancer. Yet, while purple produce has the potential to pack a punch, the research is still in its infancy, warns Professor Lars Dragsted, head of preventive and clinical nutrition at the University of Copenhagen. “The number of human trials on anthocyanins is relatively low and the studies are small. The test foods are most often plant extracts (not purified) and so there is currently not enough evidence to support claims for any health endpoint. There are still several interesting findings with purified anthocyanins though, but I would call these investigative,” he says. 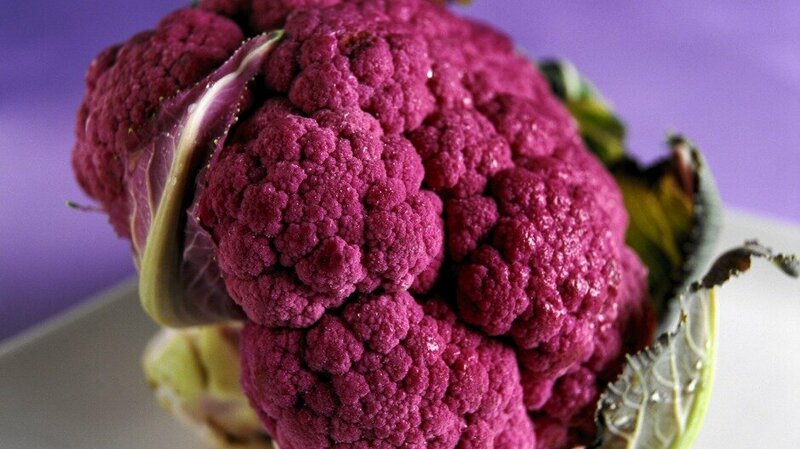 However, don’t be disheartened – purple produce has some powerful properties. “There are so many emerging health benefits of anthocyanins, including that they’re anti-inflammatory, can support the immune system and help our gut health,” says Cashion. As for which purple hue is best for you? Go forth and pretty up your plate with them all. “Eggplants are great roasted with olive oil and spiced with Middle Eastern flavours or baked whole and stuffed with other vegies; purple sweet potato makes excellent chips – simply flavour them with herbs for a crunchy snack on the go; and purple wombok or red cabbage make for a great inclusion in Asian summer salads,” suggests Cashion. Want to make sure you’re getting your dose of purple at all peak times? Unfortunately in-season Aussie blackberries are tightening up during March and won’t be back until November. However eggplant, red cabbage, blueberries and purple sweet potato are available all year round and are eating particularly well, so get them now while they’re hot.